Donald E. Keyhoe (1897-1988) was an ex-Marine Corps pilot who turned to writing for the pulps in the 1920s. His stories were aviation adventure tales but with a very large dash of weird fiction. Strange War is a collection of six of the sixty-four stories he wrote about Captain Philip Strange, the Brain-Devil. Keyhoe later became a UFO freak. Philip Strange had been a carnival performer doing a mental act involving hypnotism, and had studied various eastern esoteric philosophies. When the First World War broke he was assigned to G-2, the US Army Air Corps’ intelligence section. He was a fighter ace and a spy-hunter and helped to foil various outlandish German schemes to spread terror and confusion. 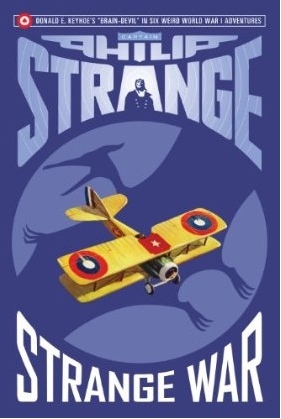 The stories combine aerial combat and espionage with elements of the bizarre. In Scourge of the Skies a diabolically clever German scientist has developed a gigantic mechanical pterodactyl. Other stories involve death rays and beams of light that cause instant senility, or what appear to be ultra-advanced super high speed aircraft. The Western Front is stalked by monsters and by strange irrational fears. Interestingly enough these uncanny threats are all given reasonably rational explanations - very unlikely explanations but non-supernatural. There’s some delightful technobabble here. Strange is a master of disguise as well as being well-versed in all kinds of mental feats and possessing skills that approach the paranormal. The stories are wonderfully offbeat and the style is pulpy and breathless. There are various malevolent figures working for the German Empire who seem to be inspired by fictional diabolical criminal masterminds such as Dr Fu Manchu. In fact the tone is a bit like Sax Rohmer’s Fu Manchu stories but with more technology and more science, albeit weird fringe science. A cross between the Fu Manchu books and Buck Rogers. The stories were originally published in a pulp magazine called Flying Aces. Highly recommended for its delirious mixture of aerial combat, hypnotism, stage magic, spies, fiendish inventions and the paranormal.